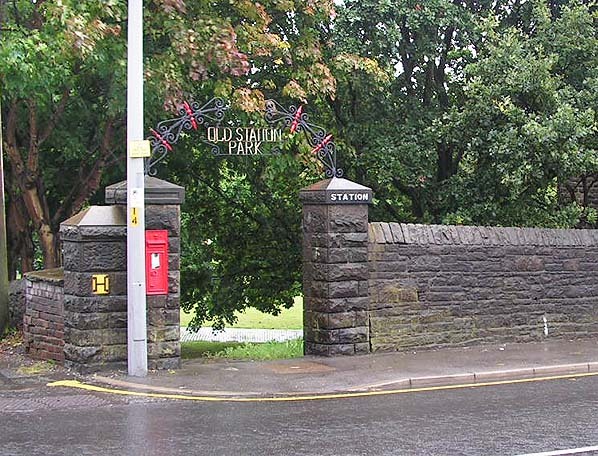 Location: South side of Church Street (B6226), Old Station Park occupies the site. Present state: Although the station has been demolished the original pedestrian entrance survives as does the cobbled access ramp and road. Notes: Horwich station was the northern terminus of a 1.4 mile branch that was opened by the Lancashire & Yorkshire Railway (LYR) on 14 February 1870. The branch connected to the LYR Bolton and Preston line. Before the branch was opened the nearest station to Horwich had been at Blackrod. The station was located on the south-eastern edge of the town on the south side of Church Street. A long single platform was provided on which stood a substantial single storey sandstone station building. The building housed the booking office, waiting rooms, store rooms and toilets for both sexes. The platform was linked at its northern end to Church Road by a sloping footpath. 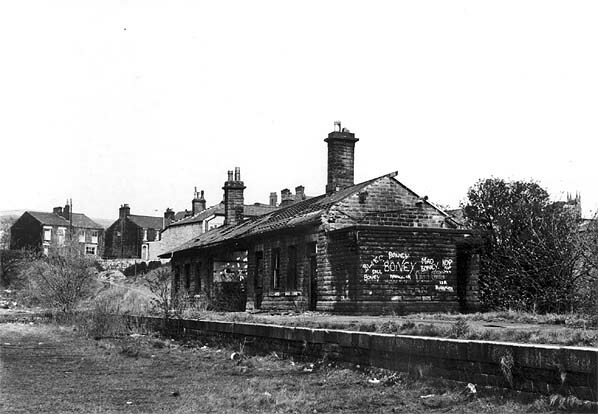 Horwich was provided with goods facilities which included five sidings and a goods shed located to the west of the passenger station. A 7 ton crane and weighing machine was also provided. access to the goods facilities was via a roadway that linked to Church Road. 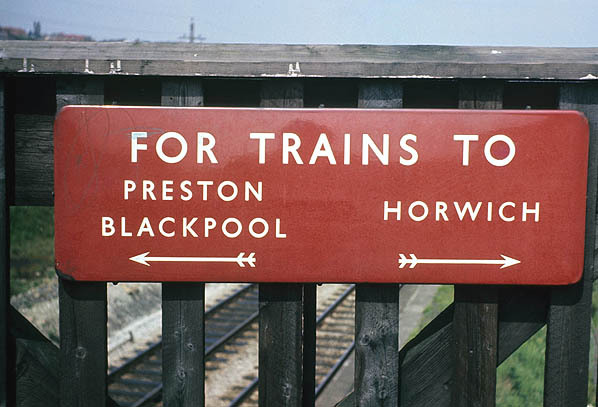 At the time of opening Horwich had train services to Bolton and to Manchester. In 1884 the LYR chose Horwich as a suitable location for a railway works. In 1886 the works took in its first locomotives for repair but over the following decades it expanded until by the 1890' s it employed over 5000 men and boys. The opening of the works brought much custom to Horwich station. The December 1895 timetable showed 20 departures and 22 arrivals Monday-to-Friday as shown by the table below. There were 2extra departures and arrivals on Saturdays. There was a Sunday service of 5 trains in each direction. On 20 March 1901 there was a tragic accident at Horwich station following the arrival of a train from Blackrod. William Dean Burgam the landlord of the Egerton Arms pub in Moses Gate was found dead on the track after the arrival of the 10.09pm train from Blackrod. At the inquest there was some discrepancy as to how Burgum had ended up on the track but he had been drinking and witnesses had seen him caught between the carriage footboards and the platform edge. The driver of the train Thomas Ellison described how he ran his engine around the train and coupled it up to the coaches. He told the inquest that after he had done so he blew off his brake and the coaches gave a little which caused Burgam to be dragged. In 1907 the LYR introduced a railmotor train onto the Horwich branch. The railmotor which was numbered 18 was built at Horwich works and it operated as a shuttle between Bolton, Blackrod and Horwich station. The railmotor was given the local name 'Blackrod Jerk' and was based at Bolton shed. On 1 January 1922 the LYR was taken over by the London & North Western Railway (LNWR). The July 1922 timetable showed Horwich as having 37 arrivals and departures Monday-to-Friday with an extra train in each direction on Saturdays. Many of the services ran only between Horwich and Blackrod. There were even 13 trains in each direction on Sundays. After only a year in LNWR ownership Horwich became part of the London Midland & Scottish Railway (LMS) who renumbered the railmotor as 10617. During the LMS years the service from Horwich remained frequent with nearly 40 trains in each direction Monday-to-Friday but there were fewer trains on Saturdays and by 1947 there was no Sunday service. On 1 January 1948 Horwich became part of British Railway London Midland Region (BR[LMR]). The ‘Blackrod Jerk’ railmotor survived until that year being the only one of its type to survive into the nationalisation period. The October 1950 timetable, shown below, showed 20 departures and 19 arrivals Monday-to-Fridays. there were less services on Saturdays. By the 1950s most of the passengers using the station were employees of the railway works who travelled on privilege tickets. In 1961 the station was proposed for closure but it survived for a few more years closing to regular passenger services on 27 September 1965. The last train ran on Saturday 25 September being the 12:05pm to Bolton. The station remained in use for goods services until 25 April 1966 although from 2 January 1966 it was reduced to a coal depot only. The railway works finally closed in 1983. 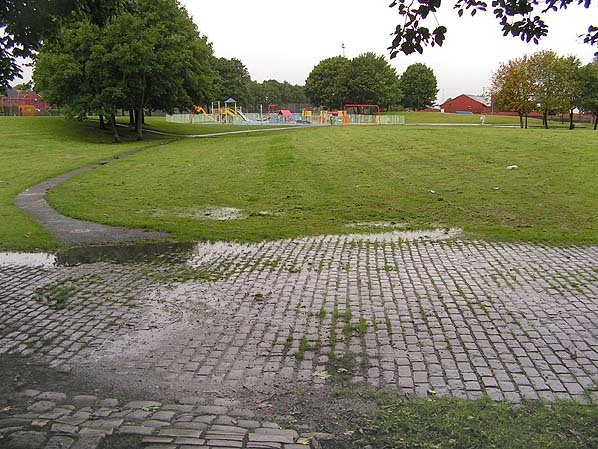 Today a public park stands on the site of the railway station. See also: Horwich Station web site. 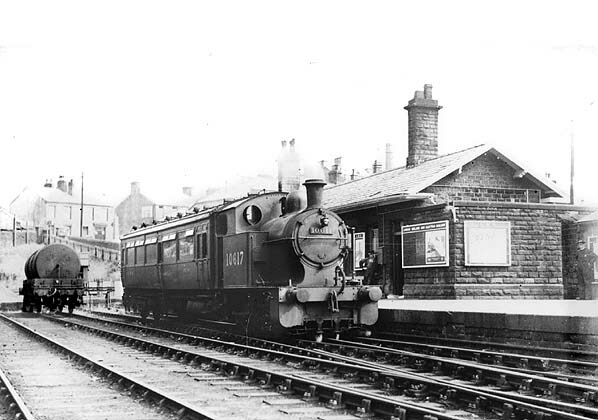 The 'Blackrod Jerk' railmotor train is seen at Horwich station in the 1930s. The railmotor was numbered 18 in the LYR years but was given the number 10617 by the LMS. Horwich station shown on an 1892 town plan. Horwich station shown on a 1928 map. 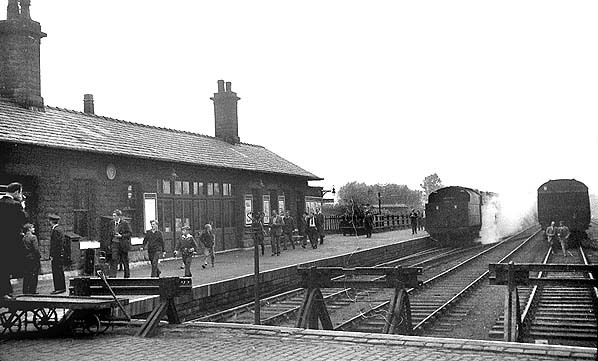 Looking north along the platform at Horwich station in the 1930s. Railmotor number 10600 is seen waiting to depart for Blackrod. 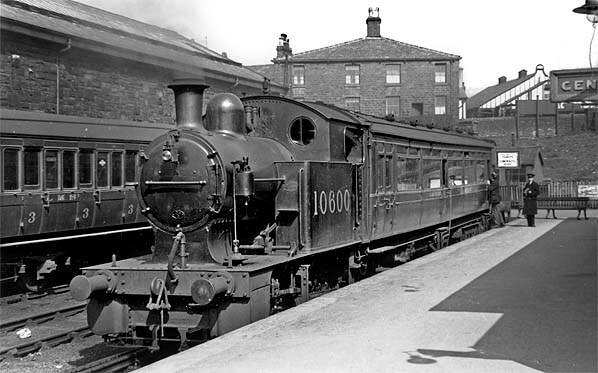 Number 10600 had started life as number 1 of the LYR and had been allocated to the Rishworth branch. 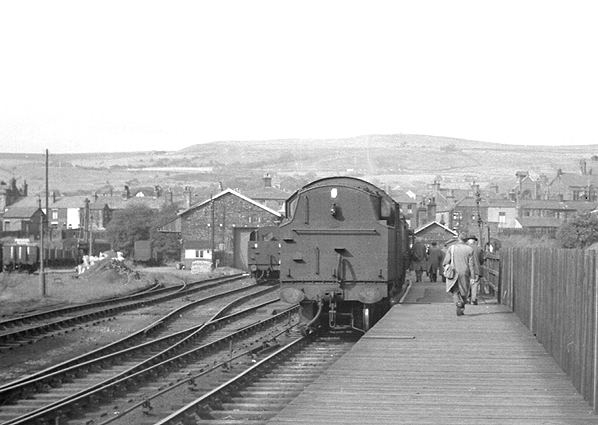 Looking north at Horwich station on 29 July 1964. Horwich station looking south from the buffers in the 1960's during a visit by a railtour. Blackrod station on 1 June 1968 with sign pointing to Horwich branch platform. Horwich station looking north in April 1976. Looking south at Horwich station in april 1976. The passenger station building and goods shed can be seen in the distance. The original pedestrian entrance to Horwich station in September 2008. A Victorian postbox probably installed when the station was opened still survives as does the word 'station' which is carved into one of the gate columns. 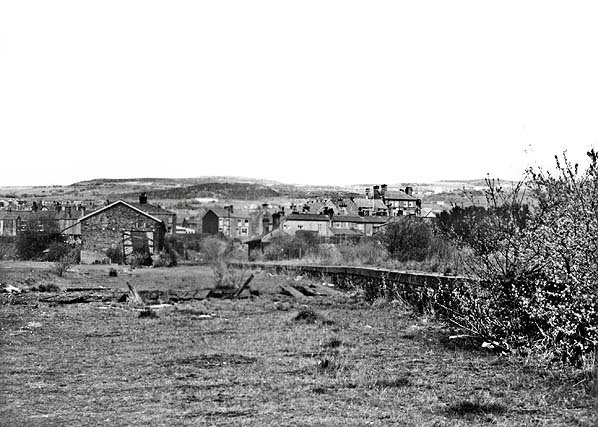 The Horwich station site looking south from a similar viewpoint as the 1960's picture in September 2008. The stone sett access road from the original station still survives.